Audio editing has never been a bed of roses for advocates of open-source software. It's not that these people are pictured as a bunch of penny pinchers longing for a freebie MP3 cutter with a heap of inbuilt fancy effects, no; semi-professional open-source audio editors and DAWs (Digital Audio Workstations) keep popping up on a somewhat regular basis, often making use of thoroughly documented algorithms so as to ensure clarity of sound processing, sometimes even offering several completely different plug-ins for a single processing technique. The problem is, those programs don't quite picture their users anything. As daft as it may sound, sound editing doesn't usually boil down to cropping the recording, applying an effect to it, and saving it in a clunky lossless format. What it does involve, however, is crafting a meticulously tweaked chain of sound processing modules and effects so as to ensure that none of the elements in that chain makes the overall result sound worse, and that it can be altered or removed if it does. For this purpose, effect chains were created. These consist of a sequence of effects linked one to another in such a way that the sound signal is processed by them one by one in real time, with no intermediate changes made to the original recording whatsoever. 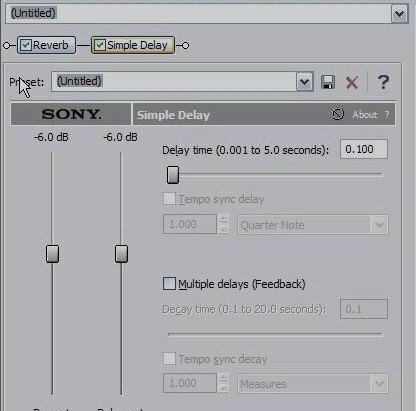 What it effectively means is that if you're trying to apply a Chorus effect to a recording after you've already added a bit of Reverb to it, and you realise that with the amount of Reverb you've chosen applying Chorus makes the whole recording sound distorted, you don't have to undo the Chorus and Reverb (and possibly a dozen other carefully tweaked plug-ins in between) and re-apply them all over again. You just open your Reverb module in the plug-in chain and change the level. This is where it becomes evident that 'Audacity', the great white audio mastering hope of the open-source community, still has a very long way to go before it starts attracting those people who've already forked out a pretty penny for a decade-old version of 'Sound Forge' or 'WaveLab' and are now considering going for an upgrade. 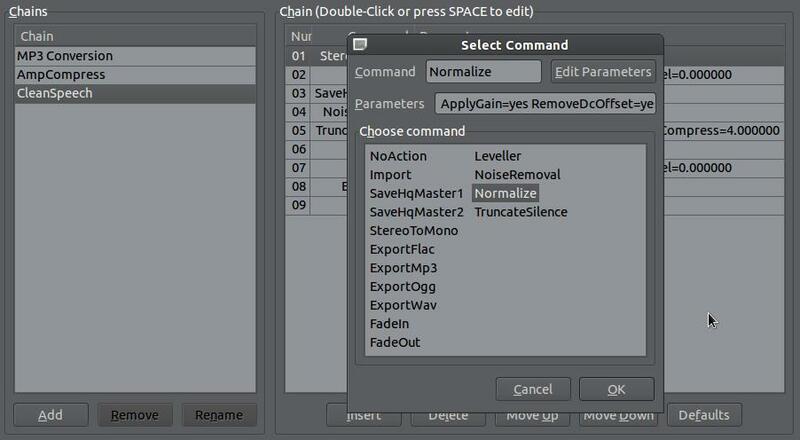 The matter is, 'Audacity' doesn't use plug-in chains as such at all. 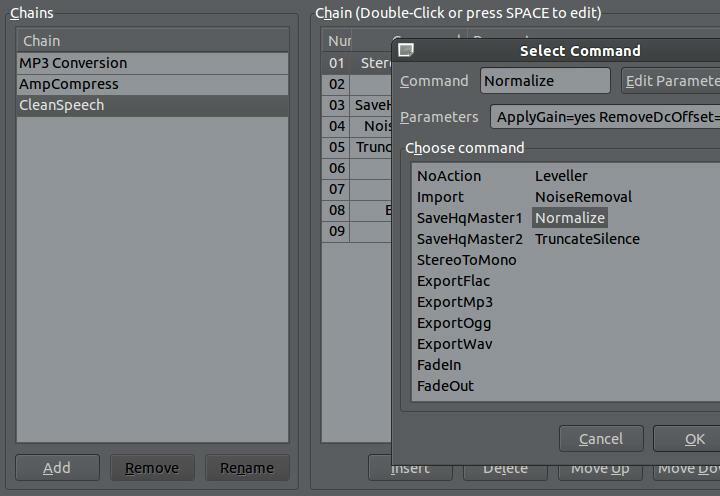 The interface of the 'Edit Chains' module found in 'Audacity' looks promising at first: it has presets and lists of plug-ins under each preset, all arranged in the order in which they are to be applied to a recording. The parameters of any effect in a chain can be altered, and effects themselves can be moved up or down the list, or even removed from it altogether. 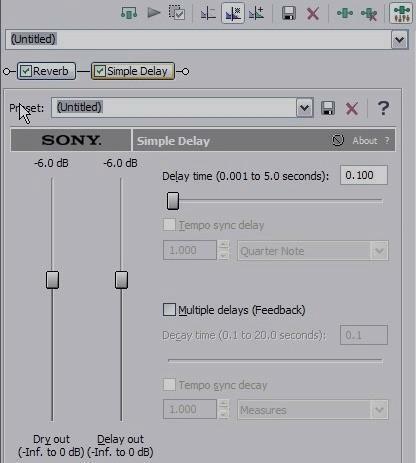 The problem, however, does arise when you start looking for the 'Apply' button: it's actually a completely different menu item, and what it does is just that - simply invoke a chosen preset, whereby it applies the effects listed therein to the original recording one by one (whereas we only expect it to activate them, without affecting the original material at all). Not only you have to re-apply a preset each time you want to alter one of its constituent modules, you also only get to undo it as a whole before that - instead of undoing only the effects that were applied after the one you intend to alter. Which makes it time-saving only if you're normalising a bunch of MP3s. So unless the developers stop inflating the list of effects trying to impress newcomers with the plethora of fancy sound processing plug-ins, but instead actually implement a way of applying those effects without affecting the original recording, 'Audacity' will remain just that - a fancy MP3 converter that looks like it wants to be your new 'Sound Forge'. Incidentally, did you know 'Audacity' usually counts as rival software when you're going for a competition upgrade when buying high-grade audio editors? So, by all means, do install it; and even if you find out you've long outgrown it, you'll get a hundred-quid (or more) discount for something more potent. It's a win-win choice. Not only that. But another problem is that it is impossible to find any plugins for the non built-in ones. And also there's no function to add them.